A petition for the organization of congressional township 131, range 44 (now Western township), was dated November 4. 1872, but as the records show no regular meeting for November this petition was not acted upon until the January meeting. The list of signers is as follow Leley Goulden. William W. Dewey, J. P. Bates, L. J. Hodges, Windsor Goulden, Knut Thompson, E. Robbins, D. Burrows, William H. Davenport, J. K. Glenn, Jr., Ole E. Olson, Win A. Wentworth, Joseph Hollbrook, Erwin Davenport, A. W. Coats, Wilson Davenport, James Burnes, B. A. Davenport and Stev Hanson. This petition was granted January 7, I873. At the same time and with the same signatures as those on the petition for the organization of Western township, another petition was presented to the county commissioners and granted at the same session. This petition read as follows: "We the citizens of the said township 131, range 44, would like you to extend our boundary north to the Red river, taking in all the fraction of township 132, range 44 (now Orwell township), lying south of the Red river." This was done for civil and criminal jurisdiction. The first election was held at the house of F. Robbins on the 25th of January, 1873. This was the twenty-fourth township organized by the commissioners and came into existence at the same time as Norwegian Grove. But even though it was organized early, the settlements in this township were not so rapid as in some of the others. This township lies in the extreme southeastern corner of the county and is bounded on the west and south by Wilkin and Grant county, respectively. 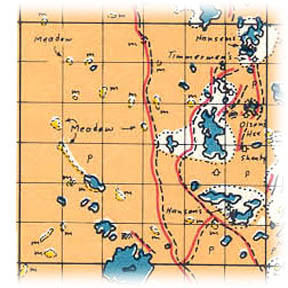 On the north it is bounded by Orwell and on the east by Aastad township. This township is out of the immediate range of the lake region yet it has one rather large lake within its limits, namely Upper lightning lake. This has a very peculiar shape. It is long and very narrow, extending over four sections in length, yet the widest part is very little over one- half mile. It was in the month of May, 1871, that a colony was formed in St. Lawrence county, New York, with the intention of settling upon railroad lands in the southern portion of Becker county, and the northern part of Otter Tail county. The colony arrived in June, but were dissatisfied with the location selected by their agents. and spent some time in looking around and choosing a location for themselves. Some returned, a portion sought other sections of the West, but ten families settled in the southwest corner of Otter Tail county, in what is now Western township. At that time there were no houses nearer than Dayton, but they brought with them stout hearts, vigorous bodies, and those habits of industry, economy and perseverance which they had acquired in the East. They immediately set about building houses, living in the meantime in tents and straw shanties. ln due time ten neat houses dotted the prairies which had hitherto presented only one unbroken carpet of green verdure. The lateness of their arrival and the time consumed in building houses for themselves and shelter for their cattle, prevented their breaking much that season, only about fifty acres being broken in the township that year. The next spring they broke about one hundred and fifty acres more, and in the fall the crops resulting from their first year's labor were as follows; Wheat, 940 1—2 bushels; oats. 303 bushels; barley, 54 bushels; corn, 50 bushels; beans, 20 bushels; potatoes, 2,000 bushels. Total crop in 1872, 3,427 1-2 bushels. In 1873 four more families joined them and built houses and barns. More land was broken, a greater area was sown to grain, and in the fall over five thousand bushels of grain alone was threshed. The township. which in 1871, was without a single inhabitant, in 1874 numbered about two hundred people and cast forty-one votes. The township was divided into two school districts in 1874 and a neat, tasty school house 16x24, and a handsome church, 24x36, were erected the same year. Over three hundred acres of new land was broken in 1874, which made about one thousand broken since its first settlement. It was the intention of the early settlers to turn a good share of their energies to dairying and stock raising. They came from a section of New York famous for its butter and cheese, and they intended to win for Otter Tail county butter and cheese as wide a fame. This township is rather sparsely settled, as evidenced by the farms which range in size from eighty to six hundred and forty acres, with the greater percentage containing one hundred and sixty acres. There were two postoffices in this township until the advent of the rural routes, but these have long since lost their identity. The former of these, Western, was located in section 14, and the latter, Roberts, was located in section 2. The town hall for the accommodations of the people of this township is located in section 22, in the northeastern corner. The nearest approach to a village in this township might be said to be at the corners of sections 14, 15, 22 and 23, where are found two churches, four residences and the town hall. In addition to the churches at this place there is another church in the southern part of section 27. Places of birth for Western Township in the 1905 state census.